As insurance claims continue to stream in, estimates for the number of vehicles damaged by Hurricane Sandy continue to rise. The National Insurance Crime Bureau said earlier this week that revised estimates for the number of vehicles damaged as a result of Sandy has hit the 230,000 mark. And not surprisingly, vehicles in New York and New Jersey make up an overwhelming number of these damaged units. New York had the most vehicles affected by the storm with 130,000 while New Jersey generated 60,000 claims, according to NICB data. The remaining 40,000 were reported from up-and-down the East coast, from Connecticut, Delaware, the District of Columbia, Maine, Maryland, Massachusetts, New Hampshire, North Carolina, Ohio, Pennsylvania, Rhode Island, Vermont, Virginia and West Virginia. But not all of these vehicles are full losses, officials noted. “It is important to note that these are preliminary figures and may change as additional claims are received and processed. Moreover, there is no determination as to the extent of damage to these vehicles. They could have sustained minor paint scratches from flying debris, or have been under water for days and rendered total losses,” NICB officials said. That said, the Bureau cautioned consumers to be aware that some of the severely damaged vehicles may appear advertised for sale without any indication that they were at all affected by Sandy and to be aware of this fact when buying used. Though the possibility of flood-damaged vehicles making their way back on to the lots and the lanes after a natural disaster such as Hurricane Sandy is certainly an issue, the industry is taking extreme measures to protect consumers, said Black Book’s Ricky Beggs in his latest “Beggs on the Used Car Market” video report. This week, National Auto Auction Association president-elect Jack Neshe and NAAA president Paul Lips joined Black Book’s Ricky Beggs during the video report, and Beggs touched on the devastation Hurricane Sandy wreaked on the East coast and dealerships in the affected areas. Neshe, the ADESA Boston general manager, said though his auction “weathered the storm very well,” others were not so lucky. “New York and New Jersey and some of the other Eastern states suffered some heavy losses in vehicles and property, and I think with the heavy losses that they suffered, it is going to create a demand for vehicles and rising values. And we are going to have to be more diligent than ever to watch for flood-damaged vehicles and what goes through the lanes,” Neshe said. Beggs, as well as the NAAA leaders, also stressed that the industry is very involved in making sure these flood-damaged vehicles do not make it back into the lanes, and that protecting consumers is a priority. After revealing the opening of a new Louisiana store just last week, Payless Car Sales announced a new dealership in the Sunshine state is now open for business. Payless has opened a new store in Fort Myers, Fla. — the company’s second location in the state. Officials noted Payless Car Sales of Ft. Myers, located at 8900 Colonial Center Drive, is the “newest and largest store in the franchise system to date” and is located on four acres. The store stocks over 300 pre-owned vehicles representing most makes and models and contains six vehicle service bays, the company shared. Also, the store features the Payless Assurance Certified Pre-Owned program. The program offeres CPO customers a vehicle inspection, vehicle reconditioning, comprehensive limited warranty, Carfax vehicle history report, roadside assistance, rental reimbursement and travel protection. The new store’s general manager, Rick Gatliff, also expressed his enthusiasm for the opening, saying, “I am excited that we are now open, and our entire staff is ready to show customers what it means to ‘Drive More … Pay Less’ here at Payless Car Sales of Ft Myers. “Our goal is to deliver a satisfying and worry-free car buying experience to every customer that visits our website or comes into our store,” he concluded. A grand opening celebration led to a community giveback for the Russ Darrow Group. As part of its recent grand opening celebration at Russ Darrow Nissan in Milwaukee, the group raised $5,600 to benefit the Breast Care Center at Froedtert & The Medical College of Wisconsin. The centers are home to a team of breast cancer specialists who collaborate to treat and support patients. Russ Darrow Group owns and operates dealerships across Wisconsin, representing numerous auto brands. With more than 600 employees, the company also operates a nationwide fleet and leasing business and has its own in-house financing company. Pictured receiving the donation check from Mike Darrow, president of Russ Darrow Group, are from left, Gillian Stewart, director of Planned Giving and Major Gifts, Froedtert Hospital Foundation; Dr. Alonzo Walker, director of the Breast Care Program; Jill Royten, RN; and Phyllis Wattleworth, RN, clinical research manager. While celebrating its 6 millionth vehicle, and five consecutive years of sales increases, Subaru of America already projected a timeline for when it might reach the next milestone. The company announced this week that it has sold its 6 millionth vehicle in the United States, a 2013 XV Crosstrek which was sold at Subaru of Georgetown in Georgetown, Texas. “Subaru has a rich heritage in the U.S., and we are excited to celebrate the six million vehicle milestone,” said Thomas Doll, executive vice president and chief operations officer at Subaru of America. The next milestone will be achieved even more quickly, Doll said. Subaru of America is the only automaker to have five consecutive years of sales increases during 2008-2012, the company said. It has broken its previous annual sales records for the past four years, and broke its 2011 annual sales record in October 2012, even prior to year end. 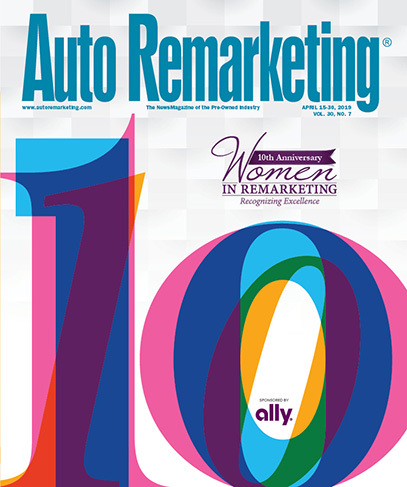 For a special section feature, Auto Remarketing recently reached out to five of the industry's leading advertising and marketing experts to get their advice for dealers when it comes to advertising in 2013. In the story — which appears in the Dec. 1–14 print edition of Auto Remarketing — they touched on everything from mobile engagement to traditional media to message consistency. More specifically, here is how our five experts responded to the following questions: What advertising advice do you have for dealers in 2013? Where would they be wise to put their advertising dollars? Kathi Kruse of Kruse Control Inc.
“First, for any dealer, one size doesn’t fit all. To get noticed by today’s car shoppers, a dealer will need to use a number of complementary channels. Specifically, a dealer’s strategy should cover the continuum from consumers researching a vehicle online to consumers who are visiting the dealership. Ideally, a plan would include traditional media, such as TV, radio, and print ads, as well as digital methods that would cover paid search, display, and online video. “At the same time, dealers should recognize how much more consumers will be tied to digital media in the year ahead. That means dealer advertising also will need to shift more toward digital. Two areas where we see high growth and high value for dealers are mobile ads and online video ads. “The mobile space provides some of the best values today for digital advertisers. We’re seeing lower cost per clicks and cost per impressions combined with higher click through rates than standard digital ads. Secondly, dealers should consider using more online video ads. Studies have shown that online video ads deliver better message recall, brand recall, and likeability scores than TV ads. Plus, like most digital ad methods, online video ads provide trackability that allows advertisers to measure true performance. It’s an underutilized channel. Superstorm Sandy took a chunk out of the market’s used-car supply, and it appears the impact to transaction prices at dealerships has already begun to play out. CNW Research indicated in its latest Retail Automotive Summary that the average used-car transaction price at a franchised dealer this month is $10,894. This is up from $10,553 last month and $10,654 in November 2011. As for independent dealers, they are fetching an average of $9,334 for every used car sold, CNW said. This is up from an average transaction price of $9,019 in October, but down slightly from the November 2011 level, when their used cars were selling for $9,452. What CNW found to be a particularly positive sign for dealers is that they have been able to keep their transaction prices closer to their asking prices. In fact, for both independent and franchised dealers, the transaction-to-asking price ratio has climbed from October. “Most encouraging, the share of asking price that franchised dealers have been able to get is 94 percent, a solid percentage gain over October, even though still a bit behind year ago,” said CNW president Art Spinella. “Independent dealers were able to get nearly 93.5 percent of asking price, a marked improvement over the previous six months,” he added. On the wholesale side of the used-car market, prices were higher than usual during the first two weeks of the month, according to NADA Used Car Guide’s Jonathan Banks. In fact, wholesale prices were off just 0.1 percent from October, Banks wrote in the Mid-Month Update posted to his Used Car & Truck Blog last week. Typically, they dip between 2 percent and 3 percent during this time frame. It seems November is continuing what have been stronger-than-usual wholesale price movements over the past few months, according to Banks. The average monthly price drop during July, August and September was only 2 percent, he said. Then in October, prices dipped 2.3 percent. Typically, values would drop somewhere between 3 percent and 4 percent during this month. “November appears set to improve upon this trend as wholesale prices have fallen by a barely noticeable 0.1 percent compared to October, which is a significant improvement over the 2- to 3-percent average fall for the month,” Banks said. “Prior to Hurricane Sandy, it was expected that the already taunt relationship between used-vehicle supply and demand would see little change in the trend of depreciation outperforming historical levels, but the destruction left by the storm has exacerbated this relationship and there has been a predictable reaction in used prices,” he added. Breaking it down by segment, AuctionNet prices for compact cars dipped 0.6 percent month-over-month, compact utility prices were off 0.2 percent, midsize utility values were off 0.5 percent and large pickups dipped 1.1 percent. Large SUV prices fell 1.6 percent, luxury car prices were down 1 percent and luxury utility values fell 0.7 percent. These all represent more moderate declines for the respective segments, but Banks brought up an interesting point when talking about midsize cars and midsize vans: prices in these categories climbed. In fact, midsize cars are up 0.7 percent with midsize vans up 0.6 percent. “The heavy fleet presence of these segments and the fact that price growth has been primarily concentrated in model years 2011 and 2012 suggests that rental companies are looking to the used market to satisfy the temporary transportation needs of consumers whose vehicles were either damaged or destroyed by the storm,” Banks noted.